Halloween Special! 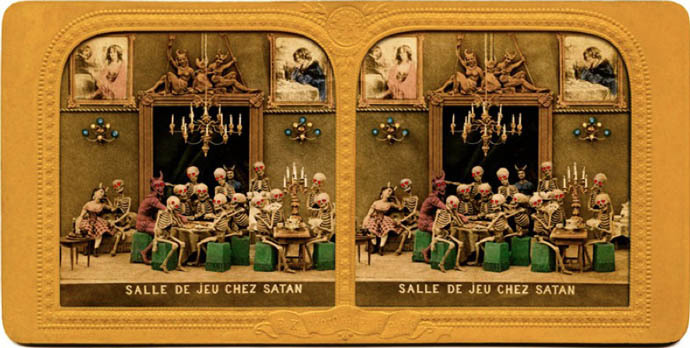 Queen man talks MOJO through Diableries: his weird collection of ghoulish 19th Century 3D tableaux. HE MAY HAVE SPENT over 40 years as a driving force behind one of the biggest bands in the world, but for the last decade Queen’s Brian May has made almost as much news with his extra-rockular activities. 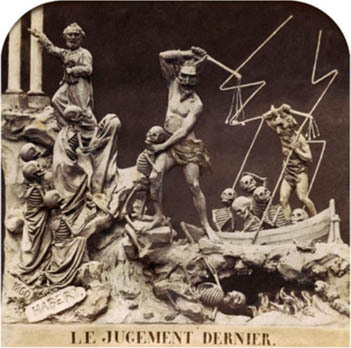 Joining badgers and black holes among the Renaissance axe-man’s areas of expertise is stereophotography, and May’s latest project in that line is Diableries: a painstakingly researched history of the satirical and politically charged 3D postcards produced in France throughout the 1850s, depicting devils, skeletons and other spooky stuff. 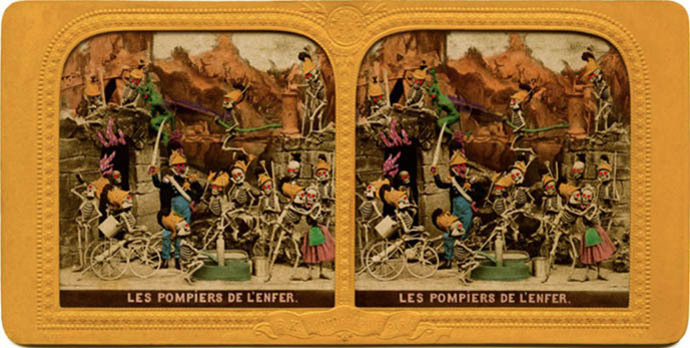 The hellish, parallel universe of the Diableries is brought to life via The Owl Stereoscope. 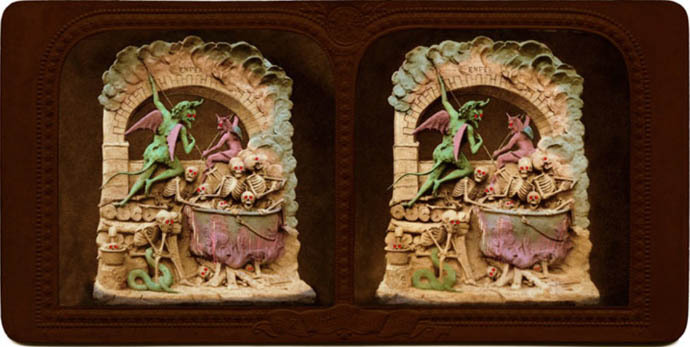 Designed by May and included in each copy of the book, it allows the reader to view the 180 eerie, often beautiful, dioramas in their full three-dimensional glory. The book (co-written with Denis Pellerin and Paula Richardson Fleming) is May’s second stereoscopic venture following 2009’s A Village Lost And Found. 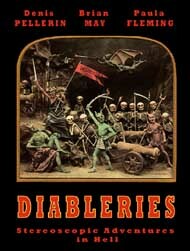 How did you come across Diableries? I got my first card in Portobello Market in 1973. It wasn’t in particularly good condition, but it didn’t spoil the illusion and the magic. Lionel Hughes, who’s now a director at Bonhams, was then a Portobello Road trader and he had stack of stereo cards. Back then there really wasn’t any information about them at all and they were very, very hard to find. Eventually, I compiled a list of the phone numbers of all the stereoscopic card dealers around the world, so when Queen started touring, I would get up in the morning and go and find them. Once I was lucky enough to find four boxes of Diableries, which has never happened to me again. 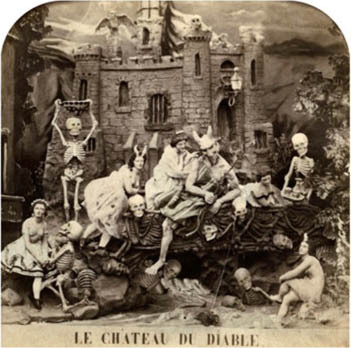 I started looking through the phone books in Paris to see if I could find any descendants of [Diableries sculptors] Habert and Hennetier, but my French is not that great so I didn’t get too far. Later I met [co-author] Denis Pellerin and we started to build up a complete picture of these people. Was it a popular form of entertainment? Yes, but they weren’t particularly cheap, so the average worker of the day would probably be only able to buy one a week. Remember there was no TV, no internet, no radio, no cinema. 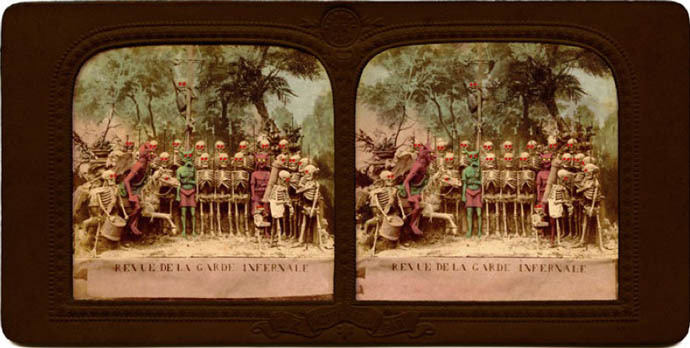 Stereoscopic pictures were a new window on the world. What does your interest in stereoscopic photography give you that music doesn’t? It uses a different part of the brain. I’ve always had many passions and sometimes they link together in strange ways and sometimes they don’t. I suppose stereo photography fulfills a thirst in me for knowledge, beauty and for solving mysteries. I’m not the sort of person to sit on a beach and do nothing – I like to be creating and to be a channel for other people to enjoy things. I love that process. I am a compulsive collector. I have, as far as possible, collected everything that Queen ever put out. It’s actually incredibly useful. You would have thought these things were easy to get your hands on but they’re not. If we’re putting out a Queen release, I’ve normally got a copy of the original artwork and the master tapes. Yes, I’ve been able to fulfill a lot of dreams over the last 10 years and I consider myself a very lucky man. So many of our dreams as musicians came true, but I have always had these other passions and since we haven’t been touring I’ve been able to pursue stereoscopic photography, complete my PHD in Astronomy and work towards being a voice for animals, which takes up a lot my time these days. I feel like I’ve transformed myself over the last decade. I still love to play music; it’s just that I don’t do it every moment of every day any more. That’s right. We had a very successful concert with Adam Lambert for iHeart Radio [in September] and the phone has not stopped ringing since. Dates are a possibility, but I am nervous of pressing that button. Because if I do, I won’t see home for a year.